From a still-born technology that failed to produce either decent sound nor ease of use, Bluetooth in its new 4.0 guise has at last come of age – and these lightweight, great-sounding earphones from Jabra are at the vanguard of that change. The Rox only last for five hours on a single charge (some gentle bells ring when the battery is about to expire), but look at the size of them; peel away the cover of the left earbud and you’ll find a microUSB slot for recharging. That does mean the earbuds themselves are a tad bulky, but they’re not at all heavy, so there’s no downside. Despite the featherlight build, this is well-made product. It’s going to last a while (probably until you stand on them – that’s what always happens to TravGear’s ear-gear). White with yellow detail, the Rox are just the latest in a batch of fitness/gym/running earphones aimed at sporty types. They come with NFC to instantly pair with most new phones to establish that Bluetooth connection, while they also have a mic inside to conduct hands-free calls. Please don’t though – you’d look like a mumbling idiot of the type found around London offices and mental institutions. Bluetooth 4.0 won’t change that. Paired quickly with an iPhone 5S, the Rox sat comfortably in our ears (the supplied all-ear scaffolding called EarGels felt intrusive, though they weren’t uncomfortable) and sent Bombay Bicycle Club’s So Long, See You Tomorrow into our brain in full Dolby quality. Was it the best-ever sound from a pair of earphones? Nope. Was it surprisingly good for such small, wireless plugs? Yes, pretty much, although there was bit of distortion of vocals – we’ve heard clearer. 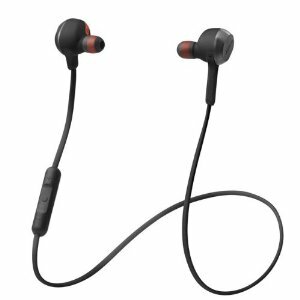 The consistently impressive bass only remains while the earbuds are firmly in place; occasionally they do need a shove, though experimenting with the vast array of silicon buds should provide a solution (hint: the EarWings do seem massive, but work well in gyms.while running). There is one trick left up the sleeve of the Rox; they automatically stop playing music if you clip the magnetic panels on the drivers together, around your neck, which is handy for a hands-free cessation of tunes (though they re-connect when pulled apart, the music doesn’t start playing automatically – you have to reach for your phone). Add some tactile, easy to learn controls on an in-line controls the slim neck cable below the right earbud, and you’ve got some lightweight, easy to use and great-sounding Bluetooth solution, but the best thing? They’re just so small; top pocket tangles are a thing of the past.